The gorilla, the largest of the living primates, is a ground-dwelling omnivore that inhabits the forests of Africa. 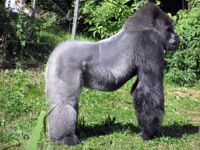 Gorillas are divided into two species and either four or five subspecies. Comparison of DNA sequences of humans and gorillas show them to be 99% identical. Attempts have been made to teach a gorilla named Koko a form of sign language, although this is highly questionable. Some scientists believe that Koko's ability to communicate through ASL is equivalent to a parrot's ability to communicate through speech. Some scientists believe that Koko is only trained to make hand gestures but does not actually understand what she is doing. Young earth creationists believe that gorillas were created about 4000 years ago. According to evolutionary thought, humans shared a common ancestor with gorillas as recently as four to seven million years ago. This page was last modified on 13 December 2018, at 13:13.